Rising Cuban star Eme Alfonso grew up performing keys and vocals in her parent’s Latin GRAMMY nominated fusion band, Sintesis. In 2008, Afonso embarked on a solo career while also serving as artistic director of the Havana World Music Festival. She has since released three albums, acclaimed for their unique blend of Afro-Cuban jazz, funk, and Latin soul. Alfonso’s latest album, Voy, continues to defy genre boundaries while also expanding her presence on the world stage, including a recent showcase at SXSW. Recorded in both Cuba and Brazil, Alfonso worked closely on this project with acclaimed Brazilian producer Alê Siqueira. The album opens with “Ayabba,” a song she has previously recorded with Sintesis. On the title track, “Voy,” Alfonso demonstrates her independence and perseverance, singing that life didn’t give her an easy road to follow, but she is still determined to make her own way. These themes continue across many of the tracks. Other highlights include “Libre,” inspired by Alice Walker’s book The Color Purple, which addresses women’s rights and gender violence. Alfonso is joined by her parents, Carlos Alfonso and Ele Valdés, on “Oroko,” as well as Cuban jazz pianist Harold López-Nussa and his brother Ruy Adrián López-Nussa on drums. The predominant Afro-Cuban rhythms and gospel overtones enhance this prayer to Oshún, the goddess of femininity and fertility. The album closes with the beautiful canción styled “Algo Más.” Accompanied by lush strings that perfectly complement Alfonso’s rich vocals, the track also highlights her years of classical training. 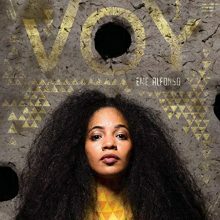 With Voy, Eme Alfonso offers an incredibly appealing mix of Afro-Cuban jazz-oriented fusion alongside more traditional songs. The album is sure to expand her fan base and, with any luck, lead to more appearances in the U.S. This entry was posted in Jazz, Latin, World Music and tagged Afro-Cuban, album review, Brenda Nelson-Strauss, Eme Alfonso, fusion, Jazz, Latin soul, Sintesis, Voy by aaamc. Bookmark the permalink.